A professional writer working from home faces unexpected challenges. For me, discipline was never a problem. I enjoy writing. After 30 years free-lancing, friends and family know not to bother me mid-day, my coveted work time. All in all, I’d established a successful routine that worked for me…until my husband retired. I tried everything I could think of to deal with his interruptions. Nothing worked. He just didn’t get it. When I write I go deep. Thoughts buzz around my head like hovering ghosts. Whole paragraphs live in invisible queues waiting to be inserted into the proper place. Sudden interruptions scare these phantoms away. It sometimes takes hours to reach the same level of productivity again. Then I met Sean Spain. Like me, Sean is a shelter person who prefers small, functional, energy efficient buildings. Like me, Sean’s aesthetic is based on the use of natural recycled materials and old found things. Like me, Sean is an artisan who worships good craftsmanship. When I discovered he built a tiny house I demanded to see it. 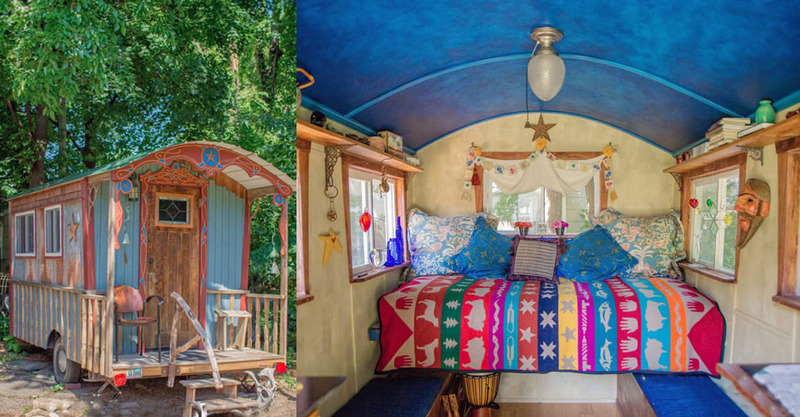 Tiny shelters have fascinated me since I purchased the delightful book Rolling Homes: Handmade Houses on Wheels in 1979. When on assignment 15 years later, I interviewed Jay Shafer in his Iowa City tiny house and was smitten. This was doable. By the time I met Sean my dream of creating a tiny house had reached its expiration date. I already had a house. What I needed was a backyard retreat where I could write without interruption. I didn’t want a kitchen or a bathroom. All I required was a desk, a chair, a place to lie down, Wi-Fi, and quiet. Thus began the most fruitful collaboration of my life. Using a 7x14-foot flatbed trailer for a base, Sean built a moveable wagon sided with corrugated metal, ringed with old fence posts, and topped with a rounded metal roof. Being mobile, the wagon didn't require a building permit, but it does need a license plate. Mimicking the designs of Romanian gypsy wagons, mine has what Sean calls the “gypsy flare,” slightly flared walls curving out to meet the roof. I designed a stained glass window for the door, and hired Sean’s sister, artist Molly Spain, to collaborate on color and paint the whole thing. The 84-square-foot interior is divided into three zones—a bed for lounging, a standup desk for writing, and a Lilliputian kitchen with a cupboard and pull-out enamel bowl for a sink. When I want to paint a canvas or other large craft project, I simply remove the futon mattress and work on the plywood base of the bed. The only purchased items in the entire structure are antique shelf brackets and a solar battery I charge inside the house. Everything else I already owned. "When I become a little old lady," the child I once was dreamed of having a carousel in my backyard. I wanted to always keep wonder and playfulness alive, no matter how old I got to be. My gypsy wagon does that for me. Tucked back in the trees in a corner of my city lot, it appears to live in a primeval forest inhabited by fairies, gnomes, and perhaps a cranky little old lady who only wants to be left alone. Not a day goes by I don’t spend time in my wagon. After sitting to write for 40 years, standing to work is a relief. I write for about 20 minutes, then take a break to stretch and move around a bit, which is far healthier than sitting in one position for hours. The biggest surprise, however, is the intimacy engendered by such close quarters. Invariably, conversations with invited friends reach a deeper, richer level inside the wagon. As does my writing.